Photos of magnificent wildlife and and nature scenes created by award-winning Canadian paper sculptor, Calvin Nicholls, have been sweeping the internet in recent days. Taking the risk that you've already been introduced to his work, it's simply too extraordinary to not be showcased here as well. 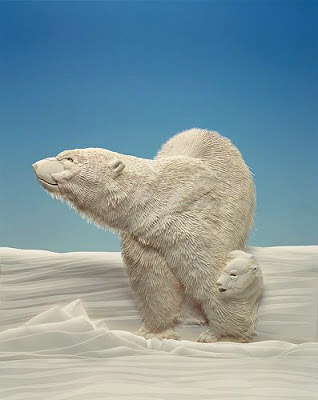 For this Fab 90 degree Friday, I'm going with polar bears on the icy tundra. The majority of Calvin's work is white on white, which leads one to better appreciate the astoundingly realistic fur and feathers via the play of light and shadows. He begins his sculptures with a drawn pattern, traces each component of the scene, transfers these to sculpture paper, and then cuts each one with a scalpel or X-acto knife on a cutting mat. Calvin uses very small amounts of glue to assemble the figure piece by piece, likening the process to shingling a roof. Calvin offers something that sounds ideal for you serious paper cutters ... schedule a Skype session with him to discuss materials, techniques, and tools of the trade. There's no better way to learn than a private lesson with a master in the field. Really... take a moment to visit Calvin's website. I guarantee you'll be amazed by his awe-inspiring paper sculptures. What a great artist, and being from Canada too, I hadn't heard of him before. I probably have seen his work but just didn't know it. I haven't seen his stuff before, so glad you posted it here. It's beautiful. And I love the white on white. I wait for your fabulous Friday posts. I enjoyed visiting Calvin's website. Truly stunning talent! What a find! WOW it's amazing, thanks for sharing!!! Thanks for the information about the book, Bev. how beautiful. add me to a canadian who wishes she knew this already! thank you for the introduction ann.